One of Tony Abbott’s key foreign policy slogans during last year’s election was “more Jakarta, less Geneva.” The Australian prime minister has been eager to live up to his promise, most recently meeting with Indonesian President Susilo Bambang Yudhoyono on June 4 in an effort to improve bilateral relations. The meeting in Batam was the first between the two leaders since Mr Abbott visited Indonesia in September 2013 and, perhaps more importantly, since revelations surfaced that the Australian Signals Directorate had conducted surveillance on a number of senior Indonesian officials in 2009, including tracking activity on Yudhoyono’s own mobile phone. The spying scandal undoubtedly damaged ties with Jakarta, but following Indonesian Ambassador Nadjib Riphat Kesoema’s return to Canberra last week, both sides appear eager to repair the relationship. That resolution is expected to come with an agreement on a new code of conduct that specifically deals with intelligence-gathering and espionage activities. Australian Foreign Minister Julie Bishop and Indonesian Foreign Minister Marty Natalegawa have been leading talks on the matter, with an agreement expected by August. “Having that code of conduct would provide a tremendous fillip to bilateral relations,” Natalegawa said. Indonesia had earlier suspended bilateral intelligence sharing and military cooperation until a formal code of conduct was concluded. Australian foreign policy commentator Greg Sheridan suggested that the “ease” with which the two leaders repaired the Australia-Indonesian relationship “is a strong indication that the damage was never as severe as much of the hysterical commentary in Australia had indicated.” But that also hints at the difficulties Australia could face in responding to Indonesia’s foreign policy after Yudhoyono. Dr Jacqueline Baker, a specialist in Indonesian politics at Australian National University, argues that Australia lacks the political skills required to navigate Indonesia’s complex domestic politics. “We just don’t do complexity in the regional relationship very well,” she recently wrote. Public opinion in Australia often appears just as conflicted when it comes to Indonesia. 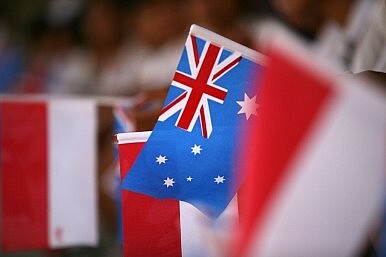 In the recently released 2014 Lowy Institute Poll, a majority (57 percent) of respondents described Indonesia’s relationship with Australia as “friendly,” but 40 percent also believe that relations with Indonesia are “worsening.” The key policy priorities identified by respondents for the Australian and Indonesian governments to work on together are perhaps the most difficult: regional security, terrorism and the issue of asylum seekers and people smuggling. With Foreign Minister Bishop and Defence Minister David Johnson set to travel to Indonesia next week, the Australian government is clearly hoping to build on the success of the Batam meeting. Gaining agreement on a new code of conduct will be a vital second step to improving Australia’s strategic relationship with Indonesia. Is Jokowi’s Victory Good for Australia?Malcolm Turnbull Defeats Tony Abbott in Leadership SpillAustralia Begins Flights Over SyriaAustralia’s Pending Defense White PaperAustralia and Indonesia: Business as Usual?